DIY Beach Play Sand - Look! We're Learning! We usually do a family vacation in the summer, but the funds were just not there for it this year, so we were quite glad to have a little beach fun at home with this DIY beach play sand! Our kids are huge sensory seekers, so this soft and moldable play sand was a wonderful sensory experience for them. I will say that it can be rather…messy, so take my advice and lay a few towels down before you get started. After that, it’s a snap to make and they’ll play with it for hours! If your kids love this, try our fun Coffee Filter Beach Ball Craft or read some sandy stories with our list of Beach Books for Kids! We started off by reading the classic book Curious George Goes to the Beach. In the story, George explores the water, builds sandcastles, and (of course) makes a mess by being curious. Then we looked at some pictures of professional sand castles. The things people can do with sand and spray bottles are just incredible. To make our own “sand”, we used a classic play sand recipe featuring one part baby oil to eight parts flour. I decided to use whole wheat flour, since it looked more like authentic sand than white flour. I had to work the baby oil in with my hands to get it to distribute evenly. It was actually quite therapeutic. Then we dropped in some silicone baking cups and a few bento molds and the kids got to work! I just stuck our “sand” in a roasting pan, but you could easily make this on the driveway or in a sandbox. See how well it sticks together? It works beautifully with baking molds, but if you have buckets or sandcastle molds, this would be fun to use with those as well. The kids absolutely loved it! And it literally took five minutes. Beach fun without sand in your shorts! Love this activity? Don’t miss these other fun summer ideas! Plus, get more ideas for summer fun on my Summer Activities for Kids Pinterest board! This post is part of the Summer Book and a Big Idea linkup from iHomeschool Network! Click on over to read more book-based learning ideas from my fellow bloggers! That looks fun! I’m a beach lover also and it doesn’t matter how old my kids are they love playing in the sand. This is a great idea. That is inspired. We actually live on the south coast of the UK. While we all love the beach and water sports, I am quite taken by the idea of sand that is not itchy, crunchy, on the bottom of the bath or all over my floors! Near where we live they have daily sandcastle competitions and some of those sculptures are amazing, everything from cars to dinosaurs and mermaids, a space rocket once. My kids always makes a castle that looks like Corfe Castle,(i.e. ruins) and build a moat around it. Always. Lol. Surprisingly, our lopsided effort with a bit of water in the moat is yet to win! I’m so jealous! I live in a landlocked area now, but I grew up near the coast. I’d love to live by the water! 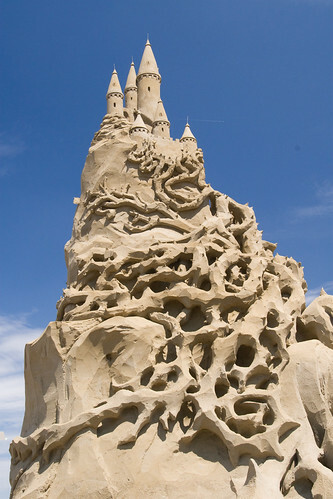 When it comes to sand sculpting, though, I’ve never attempted an actual castle. I can do a sand petal flower and that’s about it….lol. 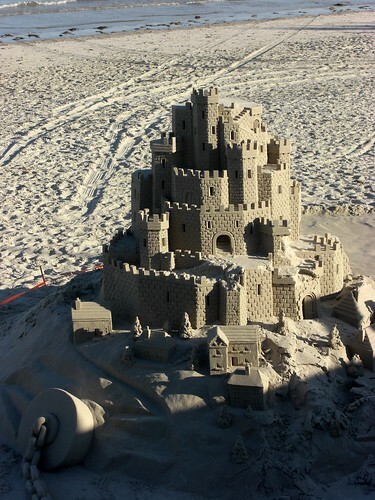 I love those professional sand castles…wowza! I’m pinning! Oh, I miss those days with fun and sand! Thanks for linking up again! I’ll be pinning this to share with More Moms out there! I really do wish my children had the opportunity to go to the beach like I did when I was growing up. Alas, we live in rural Northern Pa, not Queens NY. No where near the beaches I went to growing up. I love the idea of moon sand, this would be a great activity for the children.